“We’re all going on a… summer holiday!” The lyrics have been on repeat in my head since I left the theatre and they’re so catchy that can you honestly say you didn’t read them and sing along? If you’re now trying to remember how the next verse goes… you’re welcome. This bright feel-good musical based on the 1963 Cliff Richard film, takes you on an international road trip through Paris, the Alps, Italy and Greece (by big red bus no less) alongside Don, his fellow London Transport mechanics and new friends in the form of a girl band and American pop star. It’s completed with some of the 60’s classics which helped make the original film a hit, such as ‘Bachelor Boy’ and ‘Summer Holiday’, along with even more from the singer’s back catalogue in ‘Living Doll’ and ‘The Young Ones’ – a particularly beautiful scene. With quite the soundtrack it’s no surprise that the action was nonstop, with rarely a moment that anyone stood still on stage as there is dance routine after dance routine. Each just as impressive, if not more so than the last, with the show’s encore invigorating the whole audience to get on their feet and move. Though perhaps not quite to the same level of skill! The energy, enthusiasm and passion behind every kick and leap was boundless, from the opening scene to curtain call. A naturally brilliant singer and dancer, Ray Quinn led the talented cast as Don, delivering a consistent high-quality performance. 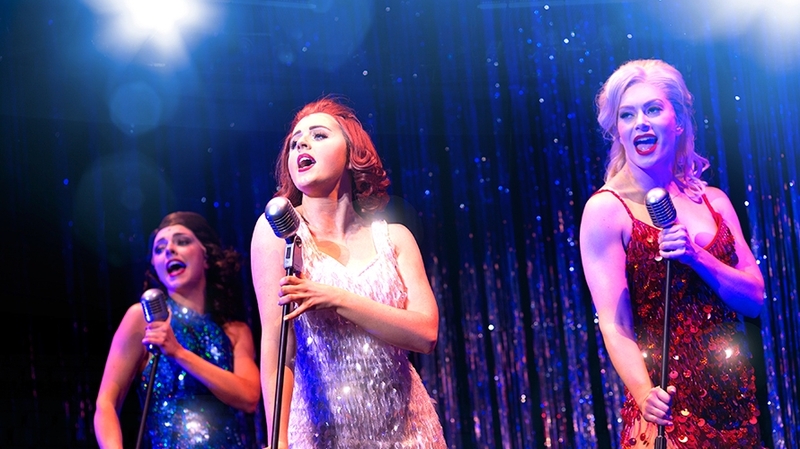 Other standouts were the girls Mimsie (played by Gabby Antrobus), Alma (Alice Baker) and Angie (Laura Marie Benson) with their melodic harmonies, precisely synchronised dance moves and group chemistry. It could have been an advantage that I’ve never seen the original movie inspiration because I went in with no expectations and fresh eyes, hoping for simple entertainment. On the other hand, I missed a vital element of nostalgia which had those around me hugging their friends and taking trips down memory lane. Summer Holiday seems to be of its time and as someone from a different generation, at times it did feel rather cheesy but it’s also very light hearted. The plot is straight-forward with little to sink your teeth into but it was still a fun ride. Where else are you going to find dancing goat riders?! At the end of the day, Summer Holiday is a great way to kick off the summer season. It has lifted spirits and got people dancing without a care in the world. I only wish that a London bus will turn up in Plymouth to start an amazing adventure. Start with a trip to the theatre and you never know!